Published: April 16, 2014 at 10:38 p.m. Updated: April 20, 2014 at 08:08 p.m. If there are winners in free agency, there must also be losers. It's the nature of the beast. It's a multimillion dollar game of musical chairs that can set the tone for an entire season. 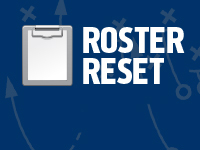 Fresh off its Roster Reset series, the Around The League guys now spotlight teams that prevailed in free agency and teams forced to look to next month's draft for offseason salvation. Lovie Smith's influence should be like a warm spring thaw after the Tampa Bay Buccaneers' wintery 2013 season. The Bucs revamped an already solid roster without losing many pieces. The signing of Alterraun Verner more than made up for cutting Darrelle Revis. Verner came much cheaper and is a better fit in Smith's system. Adding Michael Johnson to the defense gives Gerald McCoy a Bash Brother to hunt quarterbacks with. Scrapping the offensive line for upgrades at every spot was a stroke of genius. If Josh McCown can recapture his 2013 magic, the Bucs could surge to the top of the NFC South. It's about quality, not quantity. The Broncos added the best pass rusher of the past decade in DeMarcus Ware. For stretches last season, Aqib Talib was the NFL's most effective lockdown cornerback. T.J. Ward is a punishing Pro Bowl-caliber box safety. Emmanuel Sanders doesn't match Eric Decker's physicality and red-zone effectiveness, but he's stronger after the catch. That list doesn't even include the impact players returning from injury, particularly All-Pros Von Miller and Ryan Clady. Joe Flacco looms as a bounce-back candidate because of what general manager Ozzie Newsome has accomplished during Baltimore's active offseason. Re-signing left tackle Eugene Monroe ensures the Ravens a solid bookend for years to come while Jeremy Zuttah is an upgrade over last year's center, Gino Gradkowski. The team also locked up pass-catching tight end Dennis Pitta to go along with the recently signed Owen Daniels. Throw in Steve Smith -- and a running back to be named -- and Baltimore's offense should be less of a snoozefest in 2014. Mock the Raiders all you want: They believe in Matt Schaub way too much, and they still have a dearth of promising young players. However, there is no denying that Oakland is much better now than they were to start free agency. The Raiders' talent-poor roster required that general manager Reggie McKenzie sign a raft of ready-made starters in free agency. They found them: James Jones, LaMarr Woodley, Justin Tuck, Kevin Boothe, Tarell Brown, Austin Howard, Donald Penn, Carlos Rogers, Maurice Jones-Drew and Antonio Smith. Perhaps only half of those signings work out. That still marks an upgrade for the Raiders starting lineup as they inch toward respectability. Coach Dennis Allen did a laudable job coaching up a rag-tag collection of players last season, and he has more to work with this time around. The Packers made history's first big splash in free agency when they landed Reggie White, but this is an organization not known to take big chances on other people's players. That changed this season with the acquisition of Julius Peppers. Even at a diminished state, Peppers is a prime candidate to enjoy a late-career resurgence playing in a playoff atmosphere at Lambeau. Peppers and a healthy Clay Matthews are bad news for Jay Cutler and the reset of the NFC North signal-callers. Meanwhile, general manager Ted Thompson did well in bringing back core players who help keep Green Bay the class of the division. Retaining cornerback Sam Shields was vital to the secondary, and re-signing James Starks and John Kuhn keeps a nice nucleus in place around rising star Eddie Lacy. I even like the Matt Flynn re-signing. The 49ers' offseason has been a wash in terms of additions and subtractions. It has been loud in the realm of controversies and off-field issues. Neither Jim Harbaugh nor Colin Kaepernick has gotten the contract extensions they deserve, which could become distractions as the season unfolds. The more troubling part of the offseason is Aldon Smith's new controversy, which has the 49ers front office leaning toward not picking up his fifth-year option. He is also staring down a suspension from an incident last offseason. Already likely to be without the injured NaVorro Bowman, the 49ers could be looking at starting the 2014 season without two of their best defenders. The depleted wide receiving corps has garnered most of the offseason spotlight -- and rightly so. But the offensive line is just as much of a concern. Pro Bowl left tackle Jordan Gross has retired and stalwart guard Travelle Wharton reportedly is leaning toward joining him in hanging up the spikes. There are question marks in the secondary as well, with the top cornerback and safety leaving for greener pastures. The rest of the NFC South has improved while the Panthers have taken three steps back. "When your second biggest offseason addition is Brandon Weeden, you're in hot water." -- Someone in the newsroom. I couldn't agree more. Dallas did a nice job adding Jeremy Mincey and signing fellow defensive lineman Henry Melton to a cap-friendly deal, but there's no way to replace the loss of the franchise's best player, DeMarcus Ware. Seeing Jason Hatcher sign with an NFC East rival was another bitter pill to swallow and a reminder of how the cap situation in Big D has prevented the Cowboys from getting better in a division that saw every other team make strides. Jerry Jones is under plenty of pressure to nail the draft, but history suggests that isn't his specialty, either. Their best signing was ... Vance Walker. The best player they re-signed was Husain Abdullah. Meanwhile, the Chiefs lost 6,000 snaps with offensive tackle Branden Albert, guard Jon Asamoah, defensive end Tyson Jackson, returner Dexter McCluster, safety Kendrick Lewis and guard Geoff Schwartz. 6,000! These weren't Pro Bowl players, but that's a lot of change, especially for an offensive line that was playing well at the end of last season. The Chiefs' salary cap situation got in their way of adding players, and the offense lacks playmakers. This is Andy Reid's second season in Kansas City, but this still feels like a team very much in transition. Where's the sizzle in Nashville? The Titans entered free agency as the NFL's most nondescript team. Their moves over the past month should help them retain that not-so-flattering distinction for another season. Chris Johnson might not be CJ2K anymore, but he still was the biggest name brand in the building. It's wishful thinking to expect Dexter McCluster and Shonn Greene to make fans forget about No. 28. Elsewhere, we can't say we disagree with the team's decision to give up on Kenny Britt, but the Titans didn't make a move to replace the would-be playmaker. Then there's the loss of cornerback Alterraun Verner, an underrated performer whose defection makes Tennessee's secondary a less safe place for new coach Ken Whisenhunt.